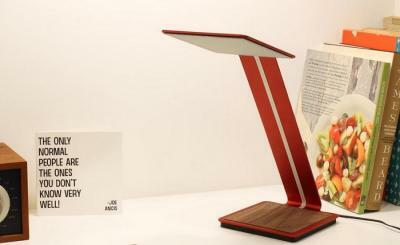 OTI Lumionics unveiled their first OLED lighting product, the Aerelight desk lamp. It uses a single OLED lighting panel and is relatively affordable at $239 (I said relatively!). OTI did not reveal the technical details - but they did say it offers a brightness of up to 1,000 lux at maximum brightness. The lamp will ship in early 2015. OTI was established in 2011 by researchers and engineers from the University of Toronto, with an aim to develop OLED lighting technologies. The company developed new OLED materials (electrode materials and transparent conductors) and also a new production process aimed towards low-cost production. It's interesting to see a startup company trying to develop materials, process technology and applications all at the same time - so I talked to the company's CEO, Michael Helander, and he explained the company's technology and business goals. It turns out that OTI started out with a mission to develop new OLED materials. As they understand it, to succeed as a material developer they needed to understand the production process, which lead them to develop their own production process with their own equipment. To succeed they researched the OLED market, while building a pilot line and also developed OLED lighting applications (the aerelight lamp is the first of those applications which they are now bringing to market). The interesting conclusion OTI came up with is that OLED lighting can be competitive with LEDs today, if you consider the whole "lamp" and not just the light source and if you go after the high-end market (but not necessarily the extra-premium one). According to OTI there's a market for devices such as their high quality $239 desk lamp. The only way to lower OLED production costs dramatically is build large (Gen-5 or larger) OLED lighting fab - but that is hugely expensive and risky. OTI sees another route to commercialize OLEDs: build a small scale fab, that works "on demand" and offers customized production. This means you can tailor the OLED panel to your niche high-end lamp design without a large capital investment - and that's what OTI hopes to bring to their market with their materials and process technologies. This somewhat reminds me of Blackbody - this OLED lighting maker is designing high-end luminaires, using their own OLED panels produced in a Gen-2 fab in Europe. When you sell a lamp for hundreds or thousands of Euros, the panel cost is not so crucial. OTI considers the aerelight as a "demonstrator" lamp, to show that you can achieve prices that are admittingly high, but not prohibitive. According to Michael, they are talking with several panel suppliers and have not yet decided on the final panel. Regarding their business plan - OTI is currently focused on the technology, mostly the scaling-up of their process. Following that they have several options - they may produce their own panels and send them to luminaire designers, they may license the technology to other material/equipment companies or they help lighting makers to setup their own low-cost production lines. It'll be interesting to see how OTI succeeds with their plans. In recent months it seems that the OLED lighting market is emerging, and they may find that within 2-3 years several companies (Konica Minolta will be the first) did invest in mass production fabs that lowered the price dramatically. UBI for example sees OLED lighting prices dropping to less than $5 for a 100x100 mm panel within three years - mostly because of larger production substrates.